Achilles tendonitis is an inflammatory condition involving the Achilles tendon, the thick strap of tissue felt behind and just above the heel. The Achilles tendon is highly important for the movement of the foot on the leg, and walking is generally impossible without it. The Achilles tendon combines the tendons of muscles in the calf called the gastrocnemius and the soleus. These muscles function is to flex the foot downward, which serves as a resistance to the force of the ground trying to push the foot upward when one is walking. The tendon is generally strong and thick, but it can become weakened through injury or chronic stress, leading to inflammation and tendon degeneration in a process called tendonitis. The Achilles tendon has several anatomic features that make it somewhat susceptible to developing strain and inflammation. The tendon fibers themselves twist around as the tendon reaches the heel bone, making the tendon somewhat structurally weaker with respect to strain injuries, and there also is an area 1-2 inches above where the tendon attaches to the heel bone that is deficient in blood supply. Both of these factors can each lead to difficulty in quickly healing even minor injuries to the tendon substance once they develop. The Achilles tendon can be injured in one of several different ways. The first way is due to an injury during sports or heavy activity. This is usually seen when the foot is suddenly flexed upward and the tendon is stretched behind the heel, such as when landing hard on the ball of the foot from a jump or coming off of a step awkwardly. It can also occur if someone else directly lands on the heel. If the force is great enough, the tendon can actually rupture. Another way the Achilles tendon can be injured is during an accident, such as a minor car wreck in which the foot is braced on a brake during impact, or if the Achilles tendon is directly struck by a heavy falling object or swinging object like a closing door. However, the most common reason people develop Achilles tendonitis is usually due to chronic strain. The tendon can be slowly injured throughout the course of normal daily life if the tendon is tight, or if one has feet that flatten out too much. Tightness of the tendon can lead to strain as the body weight forces the tight fibers to stretch beyond what they are easily capable of. Excessive flattening of the feet, or overpronation, can strain the fibers of the Achilles tendon because the heel bone rotates outward during this process, which in turn causes some stretching of the Achilles tendon where it attaches to the heel bone. Over time, these two factors will cause gradual tendon strain that leads to inflammation, pain, and tendon damage. At times, Achilles tendonitis can be associated with irritation from spurs located on the back of the heel bone that directly irritate the tendon tissue where the tendon attaches to the bone surface. It is also possible for the tendon itself to become calcified and hardened with bone-like material. The symptoms of Achilles tendonitis usually consist of a sharp pain to the back of the heel or just above it, and a dull achy pain can be felt as well when not active. The pain increases as the foot is stretched upwards, and feels lessened when the foot is stretched downward. Achilles tendon pain tends to be especially worse after trying to flex the foot upward after a period of inactivity when the tendon stiffens further. Furthermore, the tendon can be painful when direct pressure is applied to it, even if that pressure is simply from the back of a shoe. Noticeable skin swelling around the tendon is possible, but not common, although the tendon can feel enlarged and lumpy to the touch where it is inflamed and damaged. 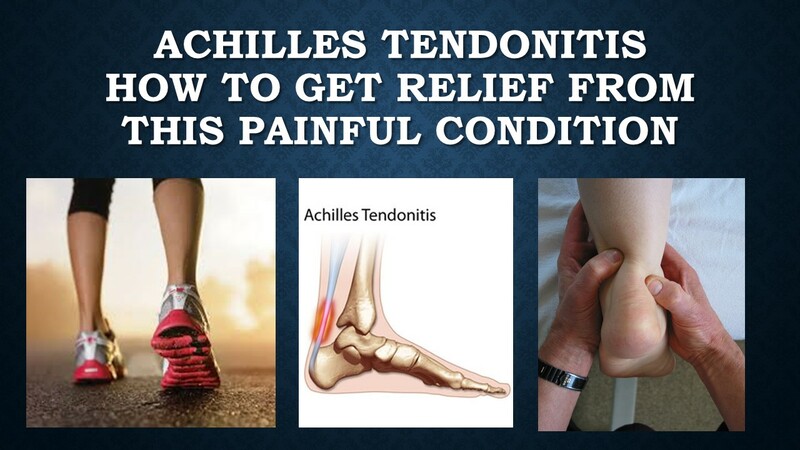 Treatment of Achilles tendonitis involves reducing the inflammation, stabilizing the tendon so it can heal, and mobilizing the tendon to prevent future injury. Inflammation can be reduced by anti-inflammatory medications, icing, and rest. Injections are not recommended in this area because the medication can weaken the tendon and cause a rupture. The tendon is typically stabilized by employing a high quality ankle brace to resist excessive ankle motion. This is typically worn during all activity, including at home. At the same time, the Achilles tendon needs gentle mobilization to increase its flexibility and reduce the potential for strain. This is accomplished through stretching exercises, although physical therapy is sometimes needed. Finally, prescription orthotic shoe inserts are often used to control overpronation if it is present to reduce heel bone rotation and Achilles strain in the long term. Severe cases of tendonitis may need surgery to repair the tendon or stimulate it to heal. This is especially the case if there are partial tears present in the tendon, or if bone spurs are present that continuously irritate the tendon. If the tendon ruptures, it needs immediate surgical repair as delayed treatment can lead to great difficulty in repairing it due to tendon stump retraction and scar tissue formation.